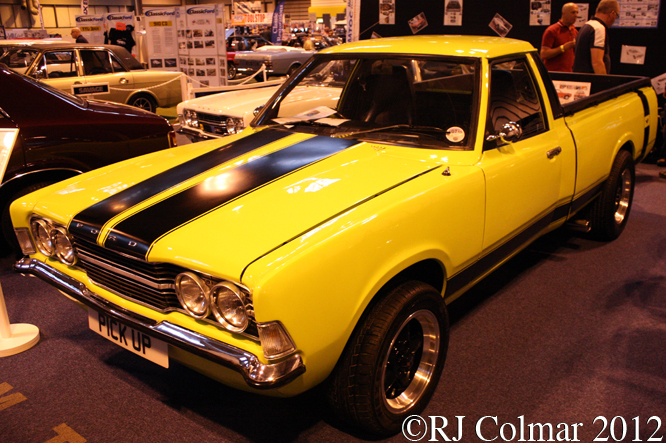 In 1971 Ford in South Africa built a version of the 2 door Ford Cortina Mk III with a pick up body on the back marketed as the Ford Cortina Pickup and known locally as the “Bakkie”. The Bakkie utilised a modified Cortina floor pan with a ladder frame to carry the rear load carrying body and initially used Rover 5 stud hubs, post 1988 examples were fitted with Ford Granada front axles with 5 stud adaptors and 5 stud Ford Transit rear axles. In 1977 the Bakkie was up graded with an adapted Cortina Mk IV body which used the shorter doors from the 4 door body and from 1980 adapted Cortina Mk V bodies were used. From 1982 the Bakkie was rebranded as the P100 model and exported from South Africa to Europe and remained in production with the Cortina Mk V body until 1988. In 1988 the P100 received a final upgrade utilising the Sierra body and production of the P100 for the European market switched to Portugal until 1993. 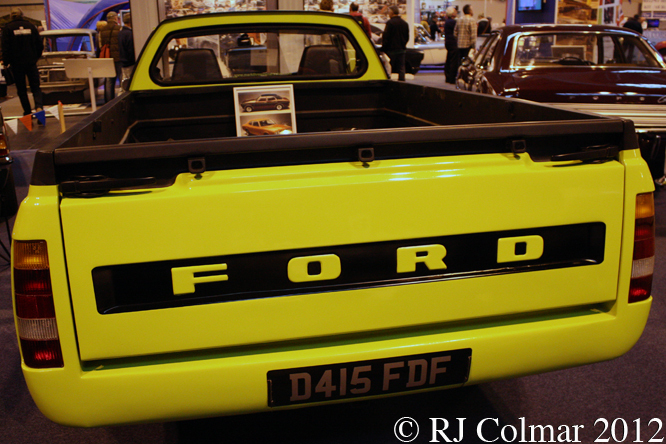 This particular 1987 Ford P100, seen at the Classic Motor Show a couple of years ago, originally carried a Ford Cortina Mk V front end, but it has been modified to carry older Cortina Mark III wings, bonnet and nose. A newer Sierra P100 pick up body has been added to the back and it is powered by a Ford Cologne 2.9 litre / 176 cui V6 as used to power the later Ford Granada/Scopio models, the interior includes Porsche 944 seats. Thanks for joining me on this “DIY Bakkie” edition of “Gettin’ a li’l psycho on tyres” I hope you will join me again tomorrow. Don’t forget to come back now ! 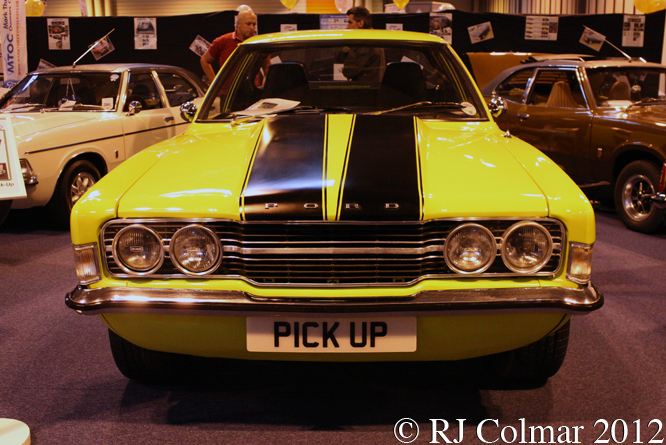 This entry was posted in Uncategorized and tagged Bakkie, Birmingham, Classic Motor Show, Cortina, Ford, Granada, NEC, P100, Pick UP, Porsche, Rover, Sierra, Transit on May 18, 2015 by Ralph. 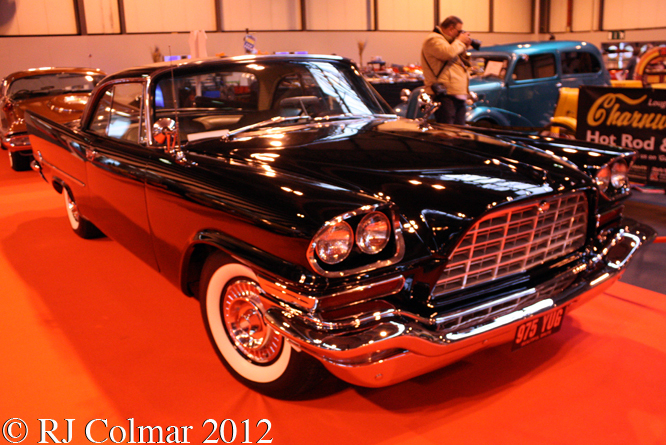 The 1957 Chrysler ‘Letter Series‘ high-performance luxury cars had evolved to the 300C model powered by either a 370 hp or 390 hp 392 cui / 6.4 litre Hemi motor and either Coupé or Convertible bodies that were styled by Virgil Exner with a new ‘yawning’ grill at the front and larger tail fins at the rear. 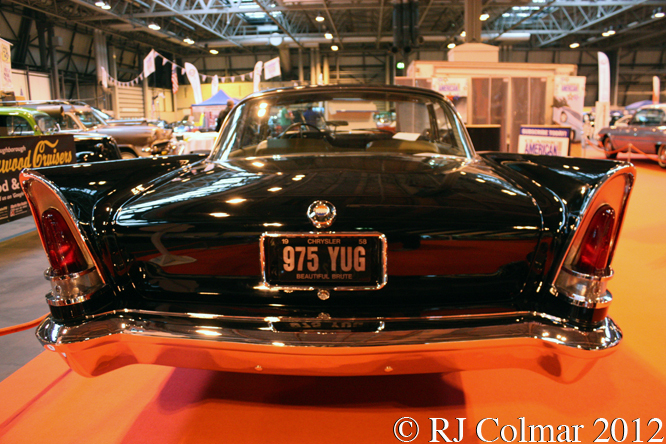 1958 300D’s, like the example seen here at the Classic Motor Show at the NEC in Birmingham, retained the 1957 body in Coupé and Convertible forms. The 392 cui FirePower Hemi motors were all tuned to produce 380 hp except for 18 fuel injected cars which produced 390hp that was so unreliable most were converted back to fuel delivery by carburetor. Norm Thatcher loaded his 300D, fitted with 8 non stock Stromberg carburetors into the back of his truck and took it to Bonneville from Van Nuys with 3 other people, supplies, food and extra tires in the trunk / boot. He then showed the cars high performance capability by recording a top two way average speed of 156.386 mph, using Firestone tyres and Quaker State oil without the aid of any special lubricants on the famous salt flats. 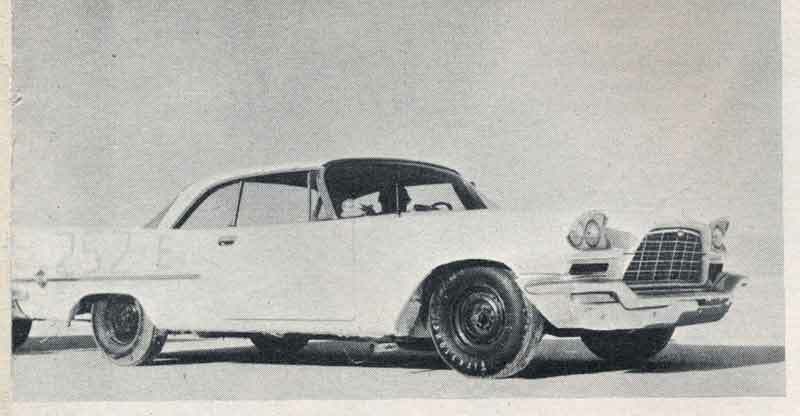 Having accomplished his mission to set an new ‘Stock Body’ record Norm loaded the 300D, one of only two with manual 3 speed transmissions and all the factory options deleted, back into his truck and drove back to his shop where the car was eventually returned to stock carburetor configuration and sold on as a daily driver which is still a runner today. Automobile sales plummeted in 1958 and so only 618 Coupés and 191 Convertibles were built, down nearly two thirds on the previous year. Thanks for joining me on this “Stock Body Record” edition of “Gettin’ a li’l psycho on tyres” I hope you will join me again tomorrow. Don’t forget to come back now ! 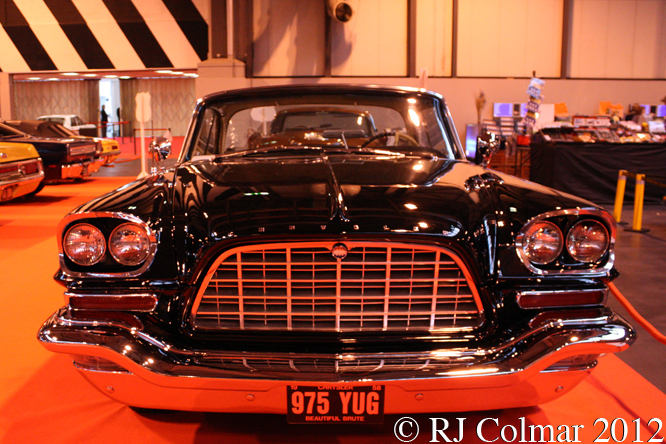 This entry was posted in Uncategorized and tagged 300D, Birmingham, Bonneville, Chrysler, Classic Motor Show, Colmar, Exner, FirePower, Firestone, Hemi, NEC, Psychoontyres, Quaker State, Ralph, Stock Body, Stromberg, Thatcher, Van Nuys on April 23, 2015 by Ralph. 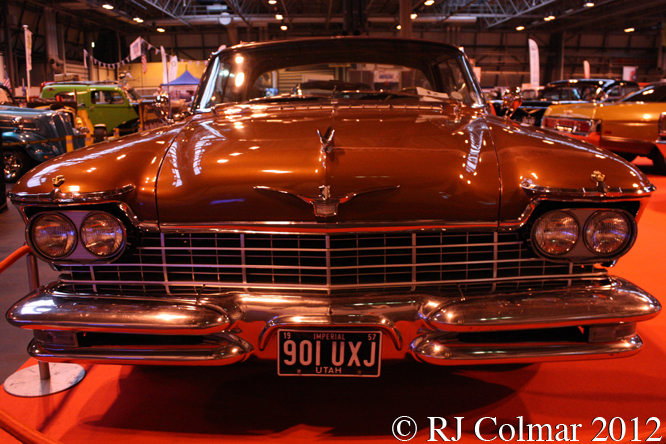 In 1955 Chrysler turned the hitherto top of the Chrysler range Imperial model into an exclusive standing alone premium brand a division of Chrysler Corporation in much the same way as Continental became a premium division of Lincoln in 1956 and Cadillac has always been the premium division of General Motors. 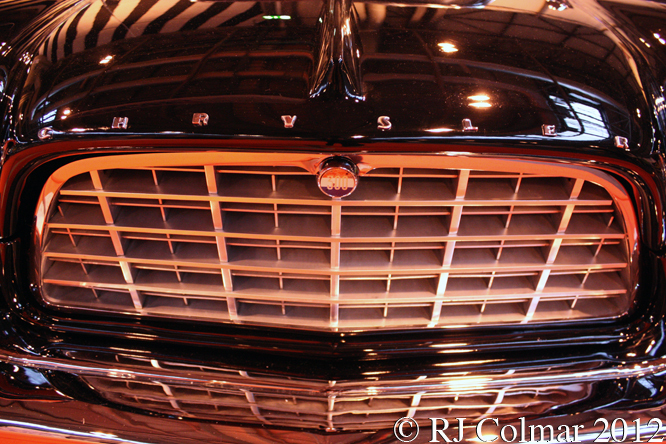 For 1957 the second generation Imperials were launched with wider platforms that were unique to the Imperial brand and wider than any of it’s rivals. 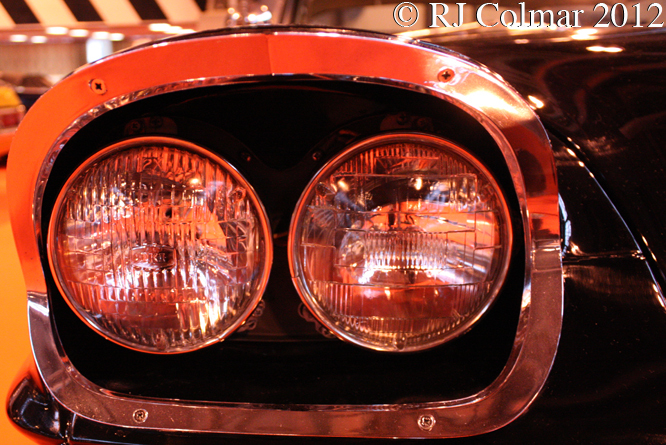 Three motor options were available ranging from 6.4 litre / 392 cui Hemi’s to 7.2 litre / 440 cui Wedgeheads. 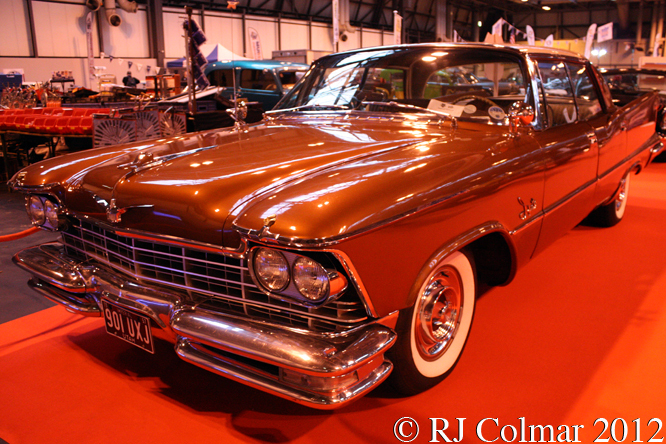 So far as I have been able to determine from the DVLA records today’s featured ’57 Imperial Crown is fitted with a non standard MOPAR 6.2 litre 383 cui engine which did not go into production until 1959. A highly rated smooth ride was facilitated by Torsion-Aire suspension with torsion bars on the front and multi-leaf springs on the rear axle the benefits of which one critic elucidated thus “cornered at speed flatter than a tournament billiard table”. 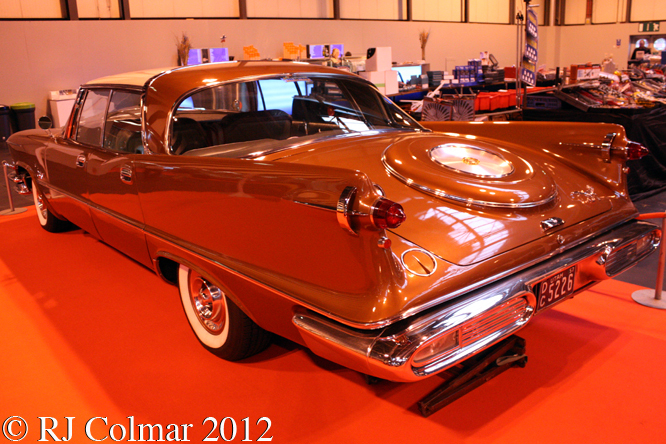 Virgil Exner evolved his ‘Forward Look’ and 1955 “The New 100-Million Dollar Look” design themes on the 1957 Imperial which featured the FliteSweep Deck Lid complete with optional faux continental tyre bulge in the boot / trunk lid. 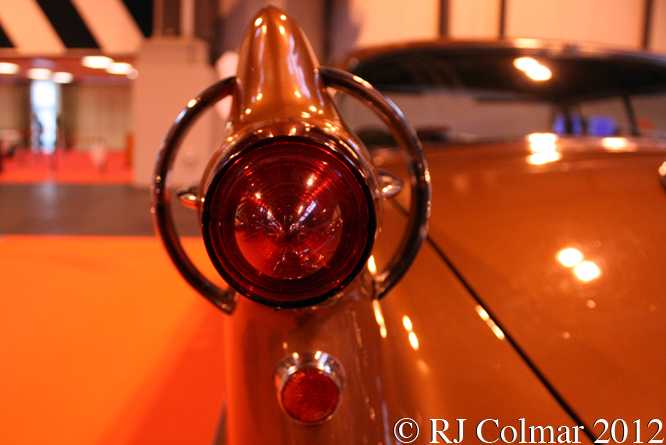 The gunsight tail lights were way ahead of the game and along with several other details would be a much copied feature on General Motors products from Buicks Buick, to Cadillacs over the following years. 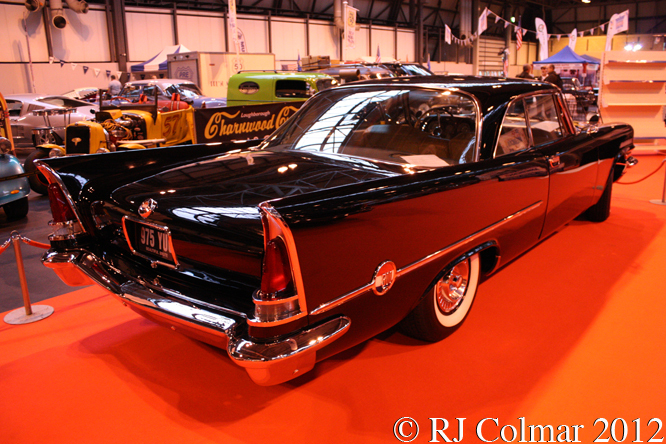 While power seats and dual exhausts were standard on all Imperials, Custom, Crown, LaBaron or custom built Crown Imperial trim levels were available according to the customers requirements. 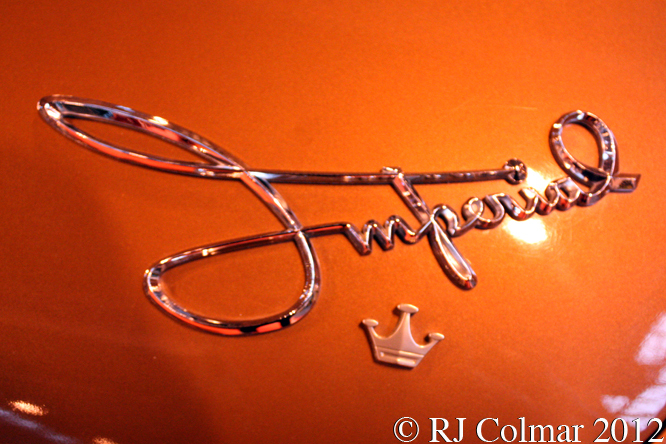 Despite being so far ahead of the curve in handling, styling and size the ’57 Imperials were outsold 1 to 3 by the ’57 Cadillacs. Thanks for joining me on this “FliteSweep Deck Lid” edition of “Gettin’ a li’l psycho on tyres” I hope you will join me again tomorrow when I’ll be looking at a highly collectible FIAT. Don’t forget to come back now ! 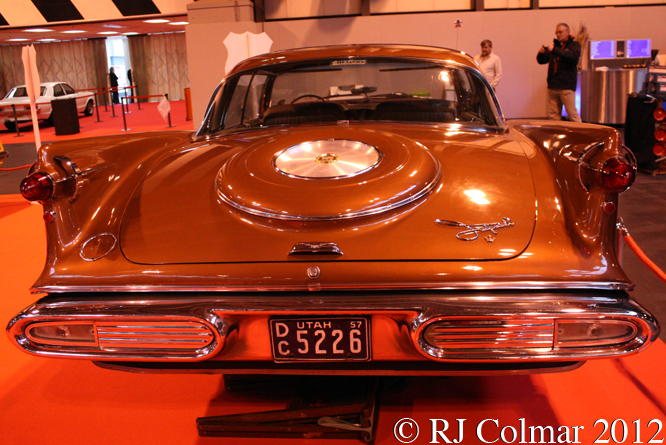 This entry was posted in Uncategorized and tagged Birmingham, Chrysler, Classic Motor Show, Colmar, Crown, Exner, FliteSweep, Forward Look, Imperial, Mopar, NEC, Psychoontyres, Ralph, Torsion-Aire on April 16, 2015 by Ralph. Born in 1938 Leonardo Fioravanti specialised in studying aerodynamics and car body design at the Politecnico di Milano. Aged 26 he joined Pininfarina as stylist in 1964, he remained with the company for 24 years eventually becoming the Managing Director before leaving to found his own styling studio Fioravanti in 1991. 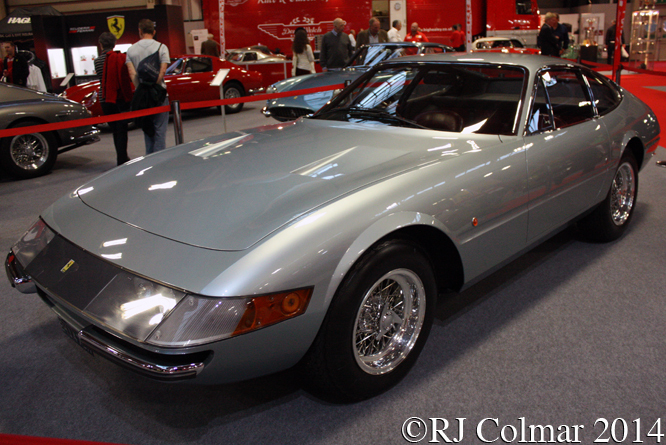 Along with responsibilities for designing today’s featured 1970 Ferrari 365 GTB/4 model Leonardo is credited with involvement with the design of the Ferrari 246 Dino, 365 GTC/4, 512 Berlinetta Boxer, 308 GTB and 288 GTO. During a television interview Leonardo confirmed the rumour that he designed the 365 GTB/4 in just seven days. 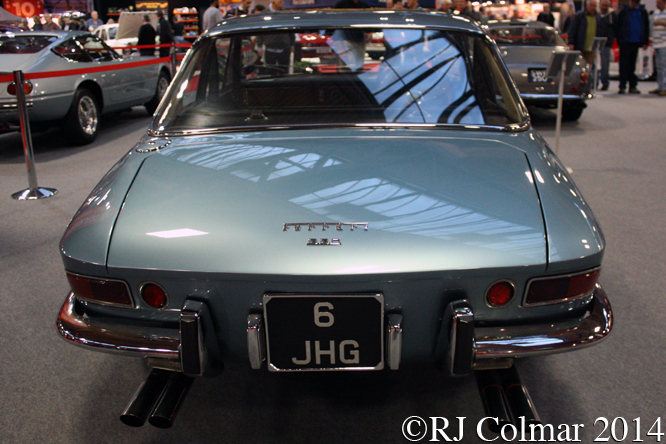 This particular 1970 RHD car was given this particular registration on the 23rd May 2012. 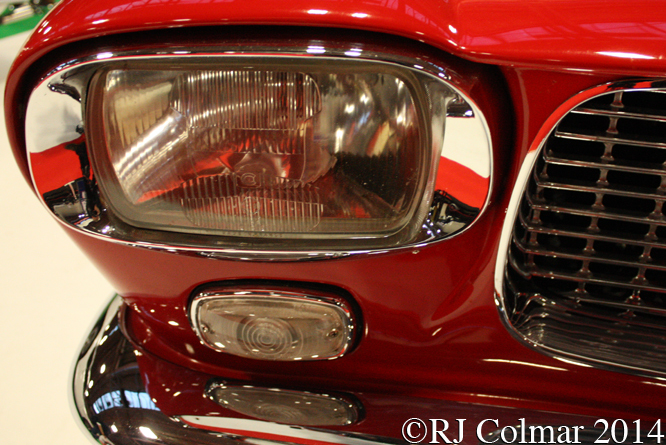 The headlights mounted behind acrylic glass feature was outlawed by US vehicle regulations in 1971. 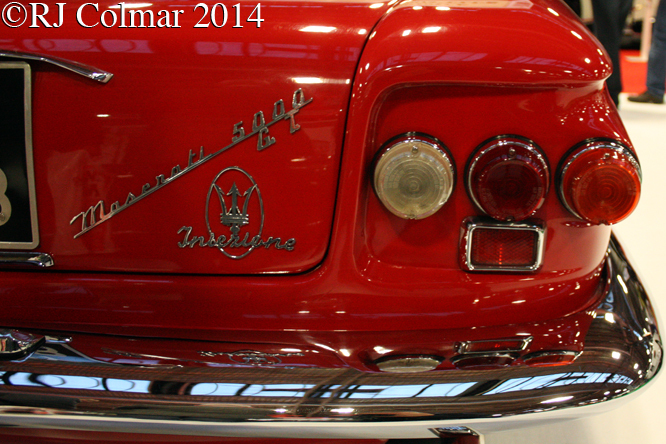 After over two hundred Ferrari Friday blogs this feature is going to be rested for a couple of month’s until June. 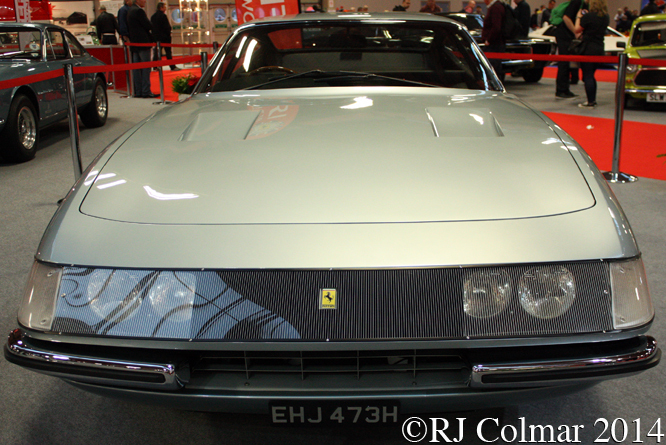 The reason is purely because I can no longer find a Ferrari a week to write about, my thanks to Jr Cracker who first suggested this feature in November 2010. Thanks for joining me on this “In Just Seven Days” edition of “Gettin’ a li’l psycho on tyres” I hope you will join me again tomorrow for a military adventure. Don’t forget to come back now ! 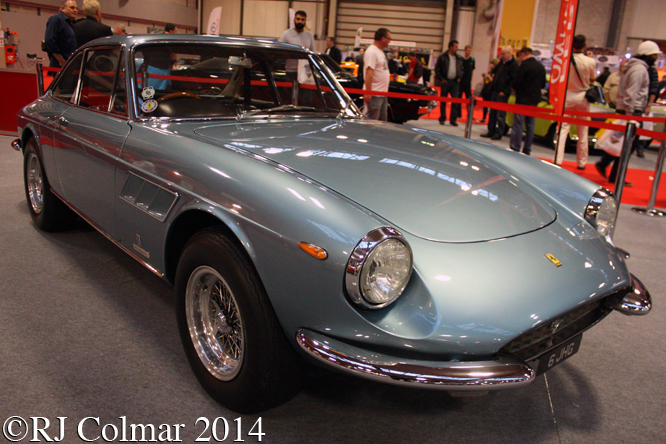 This entry was posted in Uncategorized and tagged 365 GTB/4, Birmingham, Classic Motor Show, Colmar, Ferrari, Fioravanti, Jr Cracker, NEC, Pininfarina, Psychoontyres, Ralph on February 27, 2015 by Ralph. 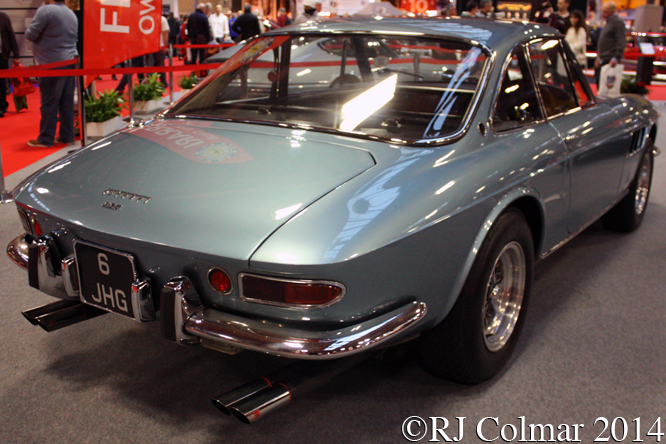 Today’s featured right hand drive 4 litre / 244 cui V12 powered Ferrari 330 GTC was built in 1968. It appears to have been with the current owner for nearly 35 years, the only interior non 1968 factory spec item the owner has fitted to this car is a 12 Volt outlet which he describes as more ‘necessary today than it would have been in 1968’. Amazingly the owner has the original two sets of three keys with ivory coloured plastic covers over the heads and the Pininfarina ‘PF’ logo moulded in to them. 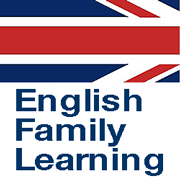 Soon after he bought the car the present owner had Original Equipment Manufacturer (OEM) Ansa Chrome exhaust tips fitted which gave the engine a concomitant ‘quiet purr’. Some years later when the car was being resprayed the bodyshop left the car outside for two or three weeks in wet weather causing the Ansa tips to corrode. The exhaust pipes and tips were replaced with stainless steel items that have lasted for 30 years, but they sound ‘a bit rorty’. Thanks for joining me on this “A Bit Rorty” edition of “Gettin’ a li’l psycho on tyres” I hope you will join me again tomorrow for a South American adventure in an Austin Seven. Don’t forget to come back now ! 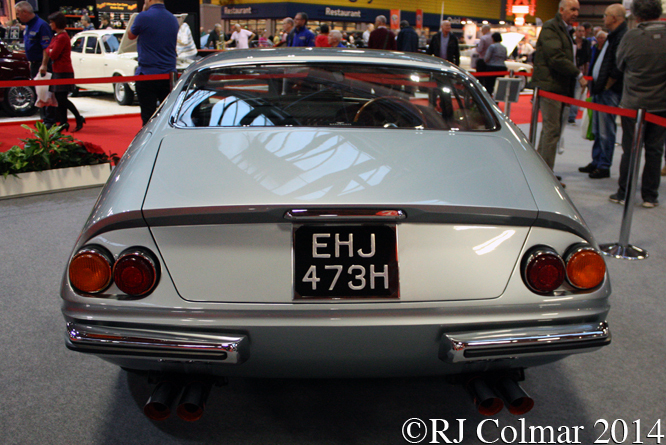 This entry was posted in Uncategorized and tagged 330, Ansa, Birmingham, Classic Motor Show, Colmar, Ferrari, GTC, NEC, Pininfarina, Psychoontyres, Ralph on February 20, 2015 by Ralph. 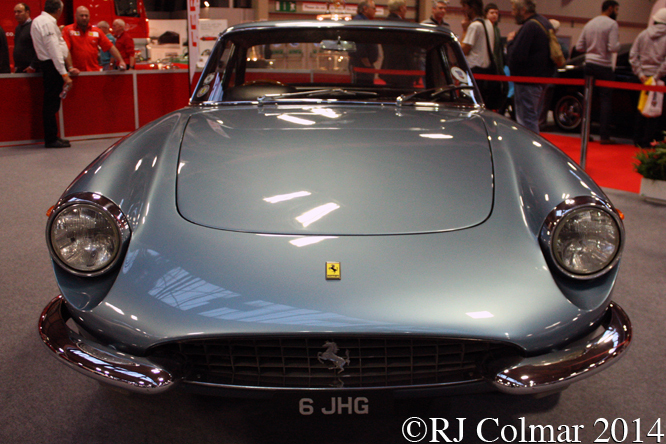 Today’s featured Ferrari 330GT was delivered to it’s first owner in Switzerland in 1964, 14 years later it went to an Italian owner where it remained unused until 2012. 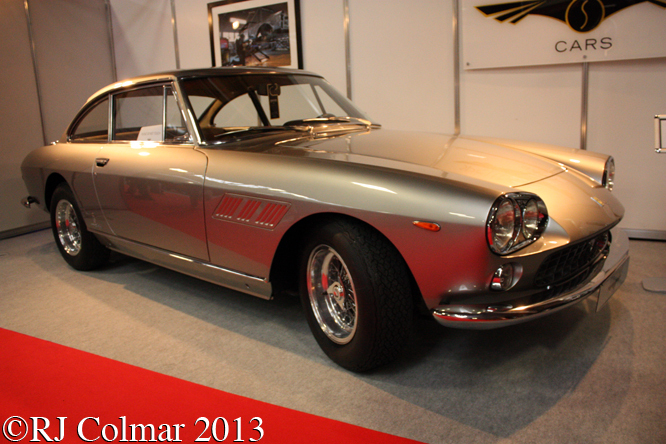 Spellbound Cars of Farnham brought the car to the UK in 2012 and restored the body, repainting it in the original Grigio Notte, refurbished the leather interior with the correct Connolly Vaumol leather and mechanically recommissioned it with their in house craftsman. Spellbound cars coincidentally operate from the same site as the former Ferrari Importer Tourist Trophy, owned by the Hawthorn Family, operated from. 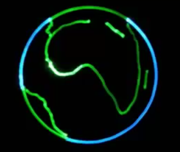 Thanks for joining me on this “Spellbinding Grigio Notte” edition of “Gettin a li’l psycho on tyres” I hope you will join me again tomorrow for another African Adventure in an Austin. Don’t forget to come back now ! 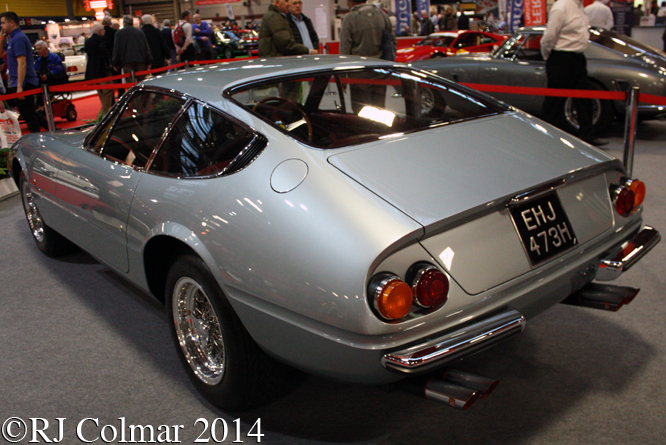 This entry was posted in Uncategorized and tagged 330GT, Birmingham, Classic Motor Show, Colmar, Farnham, Ferrari, Grigio Notte, Hawthorn, NEC, Psychoontyres, Ralph, Spellbound Cars, Tourist Trophy on February 13, 2015 by Ralph. 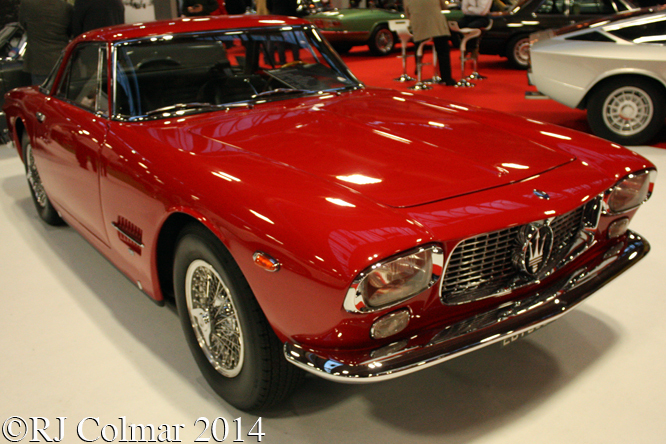 Today’s featured car is another 1962 Maserati 5000GT, one of 22 fitted with Allemano bodies. 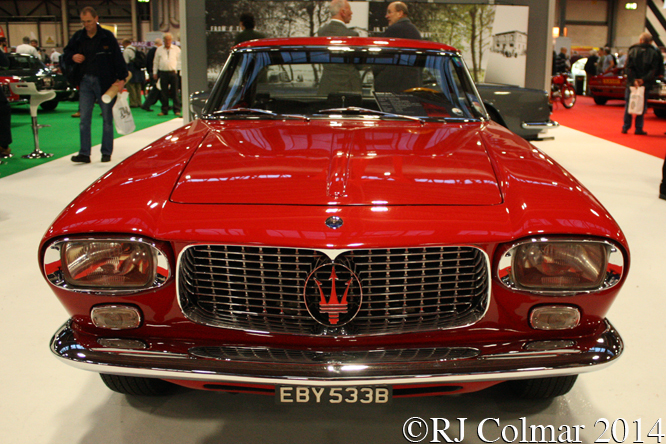 Unlike last weeks 5000GT this one is said by restorers McGrath Maserati to have been immortalised in the 1978 Joe Walsh song “Life’s Been Good”. In the song one of the verses starts “My Maserati does One Eighty Five” it actually did more like 162 mph, but goes on with the refrain “I lost my licence, now I don’t drive”. Apparently Joe did loose his drivers licence, but not by recklessly driving his Maserati as might be inferred from the lyrics, but rather more mundanely after loosing his wallet. 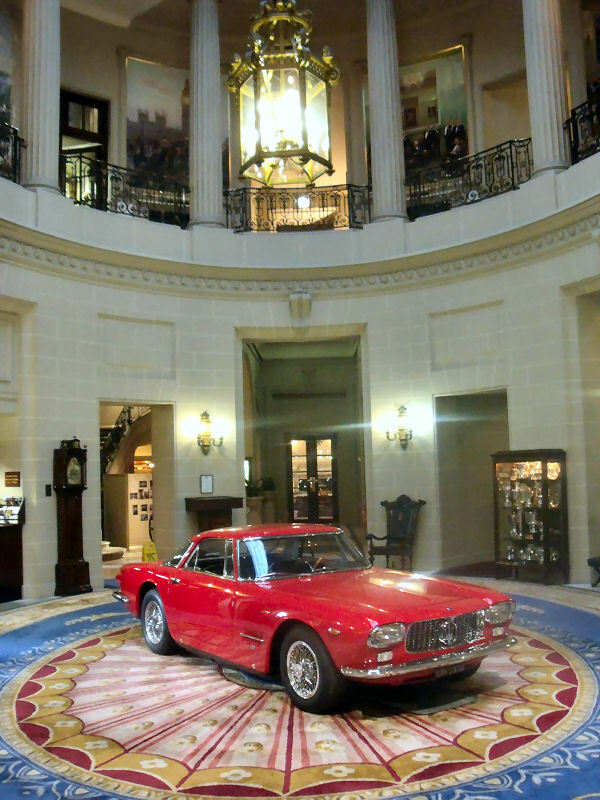 The history of AM103:026 before and after Joe’s ownership is not so well documented on the web, it was the first example of the marque to appear in the Rotunda at the Royal Automobile Club in Pall Mall, London subsequent to it’s restoration by McGrath Maserati in 2009. When McGrath Maserati started restoring AM103:026, seen in these photo’s at last years Classic Motor Show, they found significant engine damage that required a new crank and rod set, repairs to the frost damaged block and new valves and guides for the cylinder block. Thanks for joining me on this “One Eighty Five” edition of “Gettin’ a li’l psycho on tyres” I hope you will join me again tomorrow. Don’t forget to come back now ! 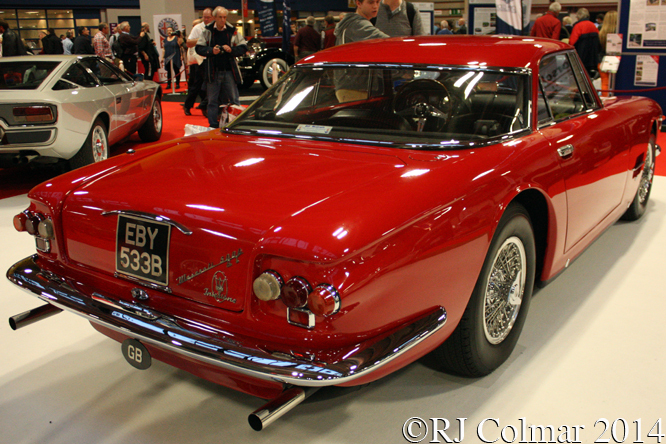 This entry was posted in Uncategorized and tagged 5000GT, Birmingham, Classic Motor Show, Colmar, maserati, McGrath Maserati, NEC, Pall Mall, Psychoontyres, Ralph, Rotunda, Royal Automobile Club, Walsh on February 9, 2015 by Ralph.